The School Supply Drive ended with delivery of hundreds of pounds of school supplies and cash donations to six local elementary schools. We’d like to thank TwinStar members who deposited school supplies in the barrels at TwinStar branches and for the cash donations made through our website and Contact Center. Total donations totaled over $2,000. Those contributions will result in warm coats and new shoes for young learners who can really use them! Studies indicate that confident and comfortable children have the best chance at becoming successful learners. 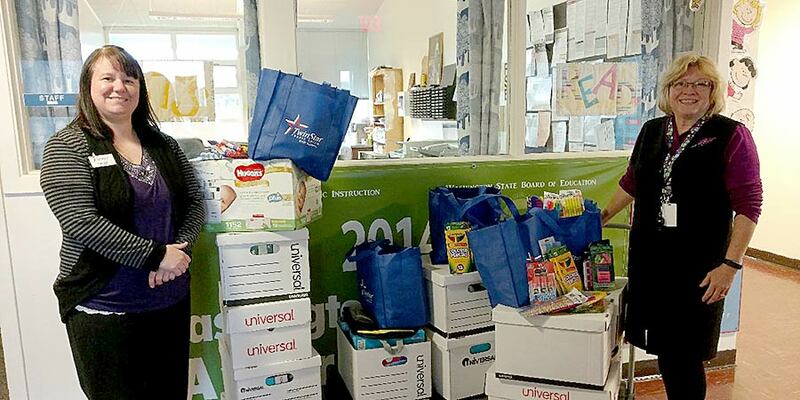 TwinStar representatives visited the following elementary schools with the supplies: Martin Luther King in Clark County, Pacific Beach in Grays Harbor County, White Pass in Lewis County, Tillicum in Pierce County, North Marion in Marion County and Lydia Hawk in Thurston County. The TwinStar Community Foundation is pleased to provide these extra school supply items to our local schools – we hope you all have a great school year! Learn more about the TwinStar Community Foundation here. See more photos of our donations over on our Facebook page.